You know, it’s getting to the point where if Rick Bayless gave me a recipe for stewed monkey brains with rabbit feces, toilet paper and chalk, I’d probably make it…and it would be delicious. I’m not sure how we hadn’t made today’s recipe thus far, but it’s fantastic. 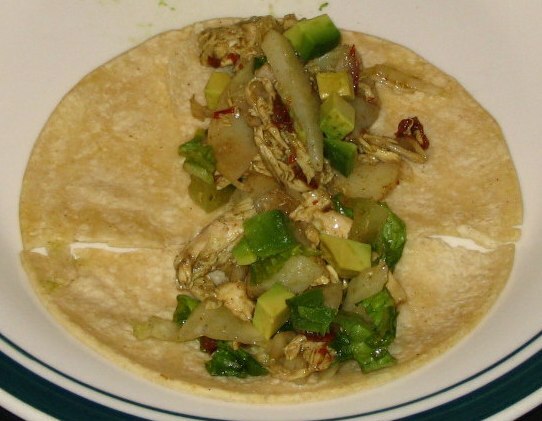 It’s almost like a chunky chicken and potato salad hybrid, infused with oregano, vinegar, spicy chipotles, crunchy Romaine, and sweet and creamy avocado. Rick’s original recipe calls for the chipotles to be seeded, but we kept the seeds and added a little honey to offset the spiciness a bit. We used a rotisserie chicken, but any leftover chicken you have would be fine. It’s a one-dish meal, perfect for warm summer days. Enjoy! Place the sliced potatoes into a large microwavable bowl, pour in ¼ cup of water and sprinkle generously with salt. Cover and microwave on high for about 4 minutes. Remove potatoes with a slotted spoon to a cutting board and let cool, reserving cooking liquid. Add the vinegar, oregano, chipotles, honey, and onion to the bowl with the potato water to make the dressing. Mix and then add salt. Use a fork to break up the potatoes into ½ inch pieces, then place them in a large bowl. Add the chicken and the dressing, and toss to combine. Refrigerate it for 30 minutes to allow the flavors to blend. 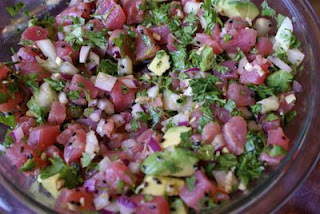 Just before serving, add the lettuce and avocado, and drizzle with olive oil and toss gently to combine. Serve with warm tortillas. Eat! I don’t know if there is such a thing as Korean soul food, but if so, I think this would qualify. It’s so absolutely delicious, bursting with the aromatic flavors of garlic and ginger, sweetness from brown sugar, salty soy sauce, and fiery pepper paste and pepper flakes. The original recipe, from www.maangchi.com, calls for pork belly. We didn’t feel like going to the Asian market, so we used boneless pork chops and they worked just fine (though we did slightly overcook them). But you could certainly use chicken, thinly sliced beef, or tofu and it would still be terrific (you’ll just need to adjust the cooking time depending on the protein you use). 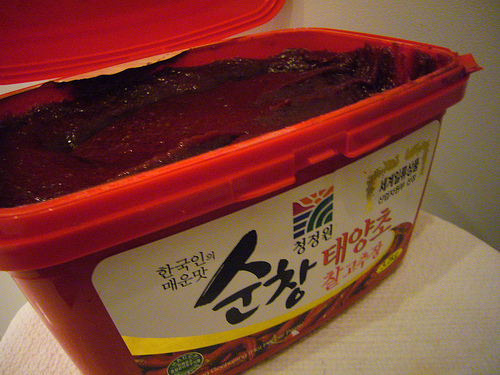 The pepper paste gochujang is what really gives the dish a great texture – you can find it in your Asian market in varying degrees of spiciness (get at least the medium one – it’s not that spicy). 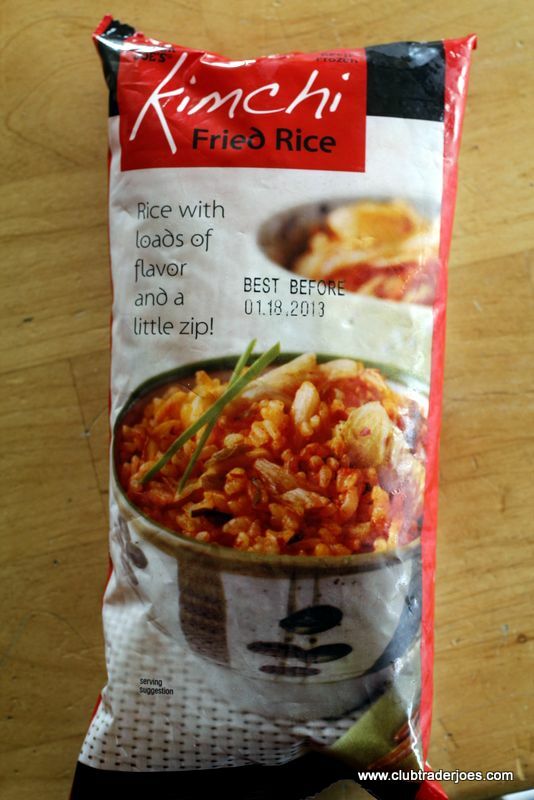 We served this with a fantastic new product we found at Trader Joe’s – frozen kimchi fried rice. Despite being microwaved in a plastic bag, I was fluffy, moist, and flavorful. There weren’t many pieces of kimchi in it, but it was a little spicy and very tasty. Good for the Seoul. Enjoy! Heat a wok or deep skillet over high heat. Place all ingredients except the sesame seeds into the pan. Mix and stir with a wooden spoon, until the pork is cooked thoroughly, about 7-8 minutes. 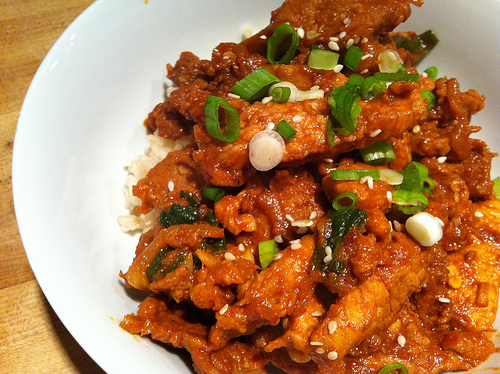 Transfer it to a serving plate, sprinkle sesame seeds on top, and serve with rice and kimchi. Eat! It just goes to show – no matter your age, you’re never too old to start liking a new food. For the last, well – 40-ish years or so – I had never made a particular item in our kitchen. And with our love of Mexican food, it seems unlikely that this item, very common in Mexican cooking, has never made it to our table. But the fact is that for the last, well – 40-ish years or so – I have had a disdain for this comestible. We’re not sure what caused a change of heart, but this week I purchased, cooked, and ate…beans. Many of you just became completely indifferent to this post, but for those of you who have known me for a while, you know that eating beans here is a big deal. Now before anyone gets too celebratory, I must concede that it was refried beans that I made – but again, for someone who has never ever, ever prepared or even liked beans, this was a culinary event. So what was the motivation after all these years to finally consume some legumes? Back in December we visited a place called Gloria’s Café in Los Angeles, a Salvadoran restaurant with terrific food. At said eatery we were served refried beans, and they were terrific. 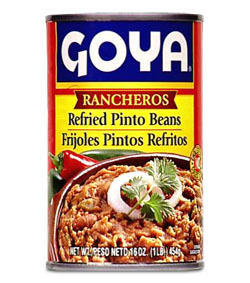 For some reason that experience came to the forefront of my foodie brain this week and I bought a can of Goya’s Rancheros Refried Pinto Beans to make some bean, rice, and cheese burritos. The “Ranchero” refers to the beans being cooked with tomatoes, onions, jalapenos, and spices, and even on their own, they were quite tasty. Wrapped in a flour tortilla with rice and cheese, they were even better. The main reason for my not liking beans is their texture – I just don’t enjoy those semi-firm, slippery little buggers. But frijoles refritos are very mushy, so that helps explain why I can tolerate – nay, like – that varietal of bean. And it only took me, well, 40-ish years to figure it out. Oh, you want the recipe for the burrito? Sure – ok, it’s pretty complex. Take a large flour tortilla. Cook some rice. Heat the beans until hot. Spread the beans on the tortilla. Scoop some rice on the tortilla. Crumble cheese on the tortilla. Roll up the tortilla. Eat. Enjoy! “Chicken is so boring!” That mantra is something not only uttered by certain 5-year-olds who reside at the MHK, but also by plenty of adults out there. We feel sorry for anyone who feels that way – yes, a plain cooked piece of unseasoned, skinless chicken is boring, agreed. But honestly, if that’s the kind of chicken you’re eating, you have no right to hyperbolize chicken and its excitement factor. 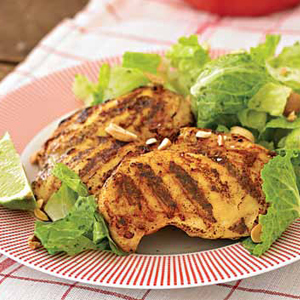 We submit that even the pickiest chicken eaters out there will go nuts – peanuts – for this recipe. This dish, presented by the Hannaford Supermarket magazine, is made with common Thai ingredients like coconut milk, curry powder, ginger, fish sauce, and peanuts, but it’s not really something you’d see on a Thai restaurant menu. Regardless, it’s frickin’ delicious. The sweetness of the coconut milk and peanut butter is balanced by the kick of the garlic and ginger, the salty fish sauce, and the aromatic curry powder, and the turmeric adds some earthiness and bright color. We served this with a salad made with a cilantro-basil dressing. Add some rice for a complete and healthy meal that tastes fantastic. Enjoy! Preheat grill to medium high. In a large bowl, whisk together coconut milk, peanut butter, soy sauce, ginger, garlic, turmeric, curry, sugar, and fish sauce until evenly blended. Pat the mixture all over the chicken thighs. Let marinate at room temperature for about 10 minutes. Brush hot grill with vegetable oil. Place thighs on the grill and cook for 5 to 6 minutes, or until well marked. Turn and continue to grill until done, about 5 to 6 minutes more. Divide on to plates, sprinkle with chopped peanuts. Eat! We’ve espoused enough about our love for Thai food on this blog, so I’ll save the back story and get straight into the food. Som tum, the fantastically fresh and spicy papaya salad from Northern Thailand, is something we’ve wanted to make for a while but for some reason never got around to it…until now. We based this recipe on one from www.thaitable.com; as far as the flavors go, it was a complete success. As far as the texture goes, it was not up to our standards. The problem was with the papaya – it’s a very juicy, moist fruit, and if you don’t get that moisture out of there, it turns very soggy; sweet and delicious, but soggy. That was the failing of the dish – somehow we will extract the moisture better next time. 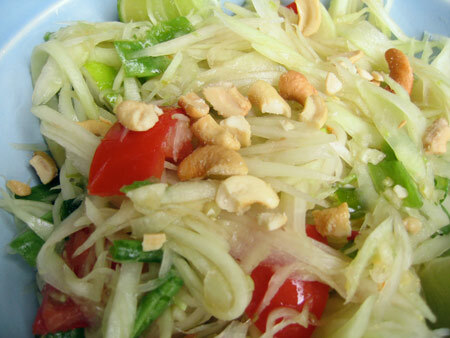 But the sweet tomatoes, the crunchy bean sprouts, the hot and spicy chili peppers, the salty fish sauce (which can be substituted with soy sauce to go vegetarian), the tangy lime juice, and the cilantro and peanuts create a vibrant ménage of flavors that is very refreshing. You can certainly remove the seeds and veins from the peppers if you don’t like it spicy, but it’s the spiciness that really brings the dish together (otherwise it’s a lot of just sweet and salty). We even used spicy peanuts, but we are kind of insane about spicy food. We used Fresno chili peppers – if you can find Thai chilis that would be ideal, but serranos would work just as well (get an extra one or two though since they are small). We served this with a quick and delicious Thai omelet (traditional Thai street food made with fish sauce and black pepper in the eggs, with cilantro and Sriracha on top – really tasty!). It was like Bangkok in our kitchen; almost as humid too, but with no underage prostitutes…that we know of. Enjoy! Combine the garlic, tomatoes, chili peppers, and bean sprouts in a large bowl; add fish sauce, lime juice and sugar. Add the papaya and mix well. Add the scallions and 1 tbsp. of the peanuts; stir to combine. Top the salad with the remaining peanuts and the cilantro. Eat! You are currently browsing the archives for the Ethnic category.